Just add your targets and you are ready to play! No need to print! These work great on both iPads AND computers (that means smart boards too)! ❤ My students have so much fun with these! Not only are they editable ✎, they are also interactive. Each game board includes interactive tick boxes ☑ for students to check off as they progress in the game. AND to make it even more fun, the included tutorial video shows you how to add movable game pieces! I have even included 2 free digital dice alternatives for those of you wanting to be fully digital ⚄. This is a growing bundle of game sets. The price will increase as I add more game sets. Each set includes 18 editable game boards. There are 3 themes in each set and for each theme there is 6 different layouts. Each layout is designed with your caseload in mind. There are layouts for articulation targets to encourage 100+ trials, there are also layouts for mixed groups of up to 4 students, plus many more variations! ► Watch this video for a more in-depth look and full tutorial on how to edit and play my editable games on computers or tablets. 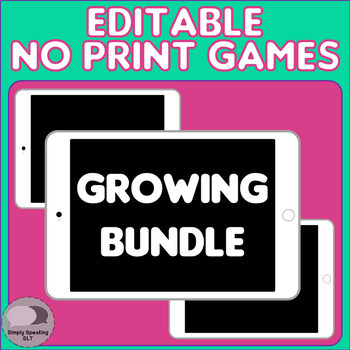 The game board featured in the tutorial video are from this download - but the instructions apply to all games included in this bundle. ⭐Download this freebie document if you want to try before you buy. These games have been formatted for device-based game play. The boards can be printed and used with a traditional dice and game pieces, but they will be very ink heavy. ✨FUN TIP: Project this onto a smart board for a fun interactive activity. Want more no-print speech therapy activities? Click here. I will be continuing to include more activities like this in my store. All new products are listed at 50% off for the first 24 hours after listing. Be sure to follow my store to stay up to date with my content and future deals. Check out my no print articulation and language spinners here. Psssst!! I also have a free articulation spinner set for the /s/ sound. This download is a great way to 'try before you buy' if you want to see how my spinners work. Click the green star ★ above to follow my store. I often upload products similar to this one and I don't want you to miss out! If you enjoy this product, please leave positive feedback to gain credits you can use towards future purchases! Find out more here.